Throughout this holiday season I hope that you are surrounded by family. 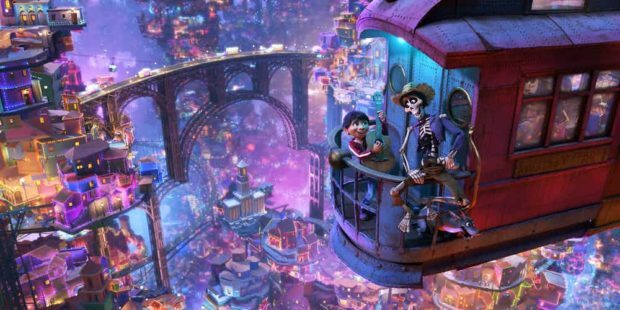 The new Disney Pixar film Coco offers up this same hope as they tell a story that will give you new perspective on what it means to remember someone and honor your family. To tell this story the film focuses on the theme of death. Pixar broaches this topic with a sensibility that matches that of their other films and they do it in a way that keeps the film kid friendly and positive. The film centers on Miguel, a young boy that is frustrated with his family because they won’t allow him to play music. Through a series of magical events Miguel ends up in the land of the dead where he meets his ancestors and soon comes to understand how much his family really means to him. Should he focus on pursuing his dream of music or reuniting with his family? The events of the film lead us on a twisting journey that will make you fall in love with the characters. 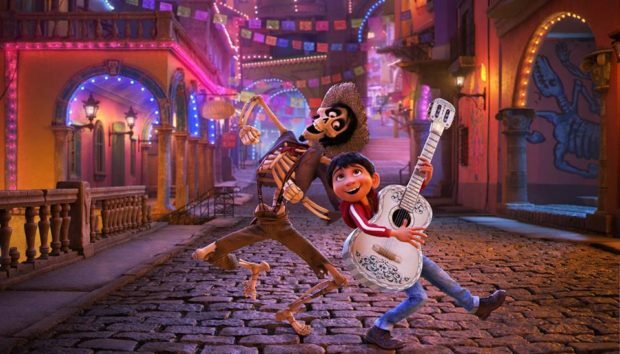 Miguel’s incredible adventure is brought to life by dazzling visuals that highlight the color and beauty of Mexico and the land of the dead, a cross between a cleaned up Las Vegas and Disneyland. Each frame of the film could be paused, printed, and hung up on the wall as a piece of art. My favorite shots came when magical golden marigolds were on screen glowing with warmth and enriching the entire scene. The film also provided a unique challenge to the film makers. How do you create a world of skeletons that are not scary and have inflection points for interaction, but still look like a skeleton? After many iterations, some of which I saw during a recent tour of Pixar that I unfortunately couldn’t photograph, the team decided on a skeleton body that would have eyes but still allow for the entire body to come apart and then back together again. This led to character interactions and deconstructions similar to Olaf in Frozen. The incredible characters of the film were completely brought to life by the incredible score and soundtrack of the film. While it’s not officially a musical, this is far and away the most musical Pixar film. John Lasseter, the Chief Creative Officer for both Pixar and Disney, made a distinction that Pixar never makes musical and that holds true here. While the characters almost all sing, the other characters known that they are singing and thus it is not a musical, but a film featuring lots of music. And boy that music is spectacular! Once you see the movie you will immediately go home and start listening to the soundtrack. I am listening to the music as I write this review and you can too right here. You’ll be hearing the soundtrack for the next year in the same way that Moana and Frozen took over. The main song throughout the film, “Remember Me”, was written by Robert Lopez and Kristen Anderson, the same team who wrote all of the music for Frozen. This film provides a fun journey into the land of the dead that will make you thankful for the family that you have surrounding you this holiday season. This movie really is the best movie that I have seen this year. Go out and see Coco this holiday season and remember the importance of family.